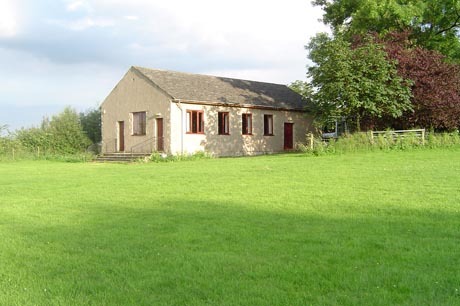 Modern, purpose built village hall set in its own grounds for rent at only £7 per hour. Hutton Roof Village Hall can accommodate up to 100 people and has a well equipped kitchen including crockery and cutlery. Disabled access is provided via ramps from the car park which has 4 disabled parking spaces. There is a disabled toilet and all the indoor facilites are on one level. There is a large playing field suitable for 5-a-side football, rounders, Inter cricket, volley ball and other sports. Marquees, Gazeebos and sports equipment may be available to hire for additional cost. Thanks to lottery funding we now have new 5-a-side goals, netball goals, Inter cricket set, volley ball net and indoor activity set including skipping ropes, balls, bean bags etc. Are you a walking, cycling or riding club having an outing around Hutton Roof? Why not book a high tea for the end of your day out. The Wigby Walkers did and said "All our walkers agreed how welcoming Sue and Jacky were last Wednesday and how delicious the cakes were and they would like me to say a big thank you for looking after us so well." You can use the hall car park and toilet facilities and we will provide refreshments at very competitive prices. Booking essential. Please contact us to discuss your requirements. On March 3rd 2013 South Ribble Orienteering Club ran a national event on Hutton Roof Crag, utilising the village hall for parking, toilets etc. The committee put on refreshments including home made soup, sandwiches and cakes. This raised welcome funds for the hall and gave SROC an good base for their event. Why not hold your business meeting, conference or training day at the village hall? Cumbria Local Access Forum did - and really enjoyed the location and the home cooking. We can provide teas, coffees, lunches etc at competitive prices. Please contact us to discuss your requirements. Save money for your organisation and support your local community. We have several marquees available for hire locally. The service includes delivery and erection, dismantling and collection by an experienced team. Our small green one was recently hired for use at a local wedding. You can see our marquees (among others) in use in the Country Fair pictures. Please contact us to discuss your requirements. 20' x 10' approx (6mx3m approx), Doors at ends,Pale green with dark green roof, See this oneused for toy stall at 2006 & 2007 Country Fair pics. Follow link for a picture. In September 2016 we were granted 2 days consultancy from the South Lakeland Community Energy Support Project, a partnership between South Lakeland District Council and Cumbria Action for Sustainability (CAfS). This gave us specialist one to one support from energy consultant Diane Hubbard of Green Footsteps Ltd. Diane examined our problems, monitored the building and recommended the new technology of far infrared panel heaters. She obtained a panel for us to try and calculated the requred number of heaters and ventilation. Local electrician, Leon Barnes, (Barn Electrical Services) made an excellent job of installing all the new heaters which were obtained from Warm4Less and we now have a lovely warm hall and the cost of running the heating will be less than half what it was! In February 2015 we were awarded a grant of £309 from Cumbria County Council towards a new wall mounted boiler for the kitchen. This was awarded under the Member Revenue Scheme. We have also been awared £6000 from the Big Lottery Fund towards replacing the kitchen units, installing a fridge and redecorating, replacing the original 35 year old kitchen! In December 2012 we completed the hall maintenance jobs paid for by the last lottery grant. The wooden floor has been sanded and sealed and looks like new. Also the ceiling has been reboarded and all the door frames, window cills, skirting boards and cupboard doors replaced following a woodworm survey. The hall has been redecorated and looks lovely, fresh and bright. In August 2012 We received a grant of £500 from Roger Bingam our local Cumbria County councillor under the Member Revenue Scheme. This has been spent on a much needed new electric cooker - replacing our very old second hand as it gave up the ghost! Also we were able to purchase a new water boiler - vital for making hundreds of cups of tea & coffee at the Country Fair and Fell Race. This equipment will get lots of use and help us in all our social and funsraising events in the future. Thank you Roger! New Roof and Solar Power Generation achieved February 2012! The new roof and solar PV system is now installed and generating! We hope to earn a good income for the hall via the FIT for the next 25 years. The installation of this system will support the long term financial security of the hall. December 2010: Loft insulation, underfloor insulation and electrical improvements are now complete and the hall is much more comfortable to use and we hope to see a marked reduction in heating bills. This will also boost the usage of the hall, especially in the winter months. On 9th December 2009, the Big Lottery Fund announced that we had been awarded £9000 for the hall modernisation project. This has paid most of the bill for the new windows and doors, supplied and fitted by Andersons. Andersons have done a great job for us and I'm sure you will agree the new doors and windows are very smart and make a tremendous difference to the look and feel of the hall. The balance of the cost for all this work comes from money raised at the annual fell race and country fair held at the end of May each year. On 11th September 2009 we obtained approval for our grant application to the Cumbria Waste Management Environment Trust. We have now had an energy audit as required and electrical work has started. A full upgrade of the insulation will follow. The grant for £5800 depended on the Neighbourhood forum grant being awarded. Once again we had a lot of help from the staff administering the grants and we would like to them for their help with the grant application process.